Among Rudolf Steiner's many initiatives that evoked visible, sustained impulses, there was one that did not develop as planned - his so-called "endowment" of 1911. 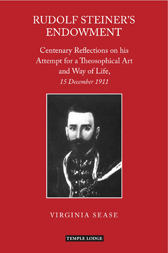 This was his attempt to create a "Society for a Theosophical Art and Way of Life", that would work "under the protectorate of Christian Rosenkreutz". Rudolf Steiner envisaged a grouping of individuals who were "...deeply moved by a spiritual power like the one that lived earlier in Christianity". Through the forming of such a Society, he sought to enable a true spiritual culture to arise on earth - a culture that would "engender artists in every domain of life". Virginia Sease's reflections - a century after Rudolf Steiner's attempt - place a special emphasis on three considerations. Firstly, that the Endowment impulse allows us to experience the art of "interpreting" in the Rosicrucian way. Secondly, that the best initiative, even one undertaken by a great individuality, is doomed to failure if the participants are unable to overcome their personal ambitions. And finally, that we may live with the fact that, despite the passing of time, the seeds dormant in Rudolf Steiner's attempt still have the possibility to come to fruition in the future. VIRGINIA SEASE was born in the United States. Her study of German literature led to a PhD from the University of Southern California in 1969. She has been a member of the Executive Council of the General Anthroposophical Society since 1984, and served from 1991 to 2001 as leader of the Section for the Arts of Eurythmy, Speech, Drama and Music of the School of Spiritual Science at the Goetheanum in Dornach, Switzerland. Her current responsibilities include liaising between the Executive Council and English-speaking anthroposophists around the world, and directing the English Anthroposophical Studies Programme at the Goetheanum.